Cyclone Chapala made a historic landfall along the coast of Yemen early on Tuesday, becoming the first hurricane-strength storm to make landfall there since reliable records began. The cyclone came ashore near Al Mukalla, an Al Qaeda-controlled city that’s home to more than 100,000 people. While Chapala had winds equivalent to a category one hurricane at landfall, the major story with this storm is rainfall. Most of Yemen lies in a true desert climate, only seeing a few inches of rain every year. Some spots can go several years without seeing any rain at all. Weather models indicated that up to a foot of rain was possible as the storm moved inland, and heavy rain falling on extremely arid ground has the same effect as spraying a garden hose on concrete. The Weather Channel reports that three people died on the Yemeni island of Socotra after Chapala’s eye grazed the beautiful island in the Arabian Sea. The island’s rough terrain allowed for flash floods and landslides as the storm dumped many times its annual rainfall in short order. Socotra is famous for its unique flora and fauna, including its instantly recognizable dragon blood trees. Pictures posted to Twitter from mainland Yemen show devastating flooding throughout Al Mukalla after heavy rain turned roads to rivers and floodwaters inundated just about every building in sight. Understandably, complete damage and weather reports are few and far between from the desert country plagued by intense conflict. Yemen was going through a “humanitarian catastrophe” due to conflict before the cyclone, and that catastrophe will only be made worse by the damage and flooding left in Chapala’s wake. 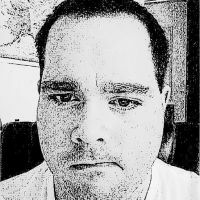 Compounding the disaster is the fact that Al Qaeda in the Arabian Peninsula took over Al Mukalla and surrounding areas earlier this year after the fighting devolved into a three-way civil war between the Yemeni government, rebel groups, and terror groups affiliated with ISIS and Al Qaeda. Any attempt at relief efforts internally or from other countries—NGO or otherwise—will almost certainly be hampered or made impossible by the ongoing security threat, and the terrorist group that controls the city isn’t much interested in helping people under normal circumstances. 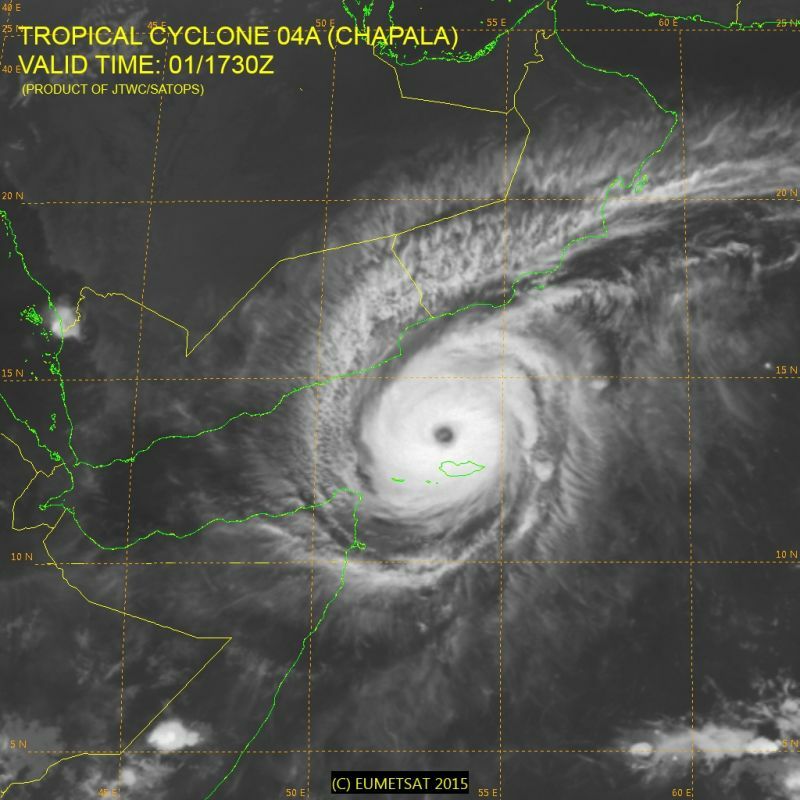 Chapala swirled its way into the history books this weekend when it became the second-strongest cyclone ever recorded in the Arabian Sea with maximum sustained winds of 155 MPH, which would make it a borderline category five hurricane on the Saffir-Simpson scale. The strongest cyclone ever recorded in the basin was 2007’s Cyclone Gonu, which had 165 MPH winds at its peak. The recent cyclone took a path rarely seen in the satellite era, bypassing Oman—which is where tropical systems would normally make landfall—grazing the Yemeni island of Socotra before making landfall in the central part of the country. Weather records are falling left and right across the world this year. Chapala formed on the heels of Hurricane Patricia out in the eastern Pacific Ocean, which itself broke the record for the strongest tropical cyclone ever reliably recorded. Hurricane Hunter aircraft flying through Patricia measured 200 MPH winds as the storm closed in on Mexico on October 23, breaking the previous reliable wind record held by Haiyan in November 2013, which had satellite-estimated winds of 195 MPH. The Arabian Sea cyclone also padded the current record for the highest number of tropical cyclones with winds equivalent to a major hurricane (115+ MPH) ever recorded in the Northern Hemisphere. We’ve seen 27 such storms this year, which, according to Dr. Philip Klotzbach, dwarfs the previous record of 20 held by the active years of 1997 and 2014. My new book, The Extreme Weather Survival Manual, is now available! You can order it from Amazon and find it on the shelves and websites of retailers near you.